I liked the twists. I dislike it when you figure things out near the beginning. So I liked that it took me a bit of time to figure it all intertwined. It was actually a tear jerker for me, especially being a father of a little girl. I rather enjoyed it and liked that the parters weren't conniving in a bad way, it was actually in a way that benefitted everyone involved which was nice to see. Well written. Great casting. Plot drew you in and unlike most movies it had an ending that tied together all the characters and their stories. A thought provoking story, that touches on the absolute dispair of the grief journey. Well worth the time! A fantastic movie! I think the critics got it wrong with this one. I guess they wanted Will Smith to act in the typecast way they have come to love the actor. He did step outside his comfort zone perhaps but I feel it made the character all the more believable. Highly recommend. I loved this movie! So well done! Amazing storyline! Also, bring your Kleenex box. I cried multiple times. Will Smith's acting is just amazing!!! The acting of the rest of the cast is really good as well! Only problem is that some of the concepts in the movie are too abstract. Very moving story. Will did an excellent portrayal, other actors very good. Only discomfort was in the idea that actors were hired to trick Will. To me, that wasn't a good thing, the means would not have justified the ends. But his eventual realization was a good thing for the character. Loved the story..actors were fantastic, especially Will Smith. Good food for thought. Have had many great conversations with my peers, my kids and my grandkids about the movie. Hard to find a movie these days that you can do that with! The movie is good on many levels and is satisfying, but not quite enough. It has some lovely plot twists, which made it worth my while. I wish they had delved deeper into the characters, and their stories. Something is missing. You will feel this film deeper and more profoundly, if you have lost a beloved one. Loved it. Everything was so perfect from the acting, soundtrack, photography wow. The story line was something that made you smile this holiday season. Thoroughly enjoyed this movie - heart wrenching story and well acted. Highly recommended. We see movies about 50 movies per year and this was our favourite for 2016. Great movie , some would say true story. This movie was really well done- so unexpected and unpredictable at times. Very unique storyline and the actors all did an amazing job. Not Will's best picture. It lacked originality. Tons of cliches. 2 thumbs down. This movie was stupid and boring. If they were trying for a knock-off of "It's a Wonderfull Life" they missed the mark by a landslide. it was predictable. Waste of time and money. This was just the ideal kind of movie to me - great actors, excellent plot, creative ideas, and some real heartwarming relationship issues being developed and explored. Loved it! Dragged on and on. Should've boycotted this one. I really loved this movie. Will Smith was very believable. Great family movie. I am a big Will Smith fan and he truly delivered. He pulls at your heart's strings when his face shows anguish. It is multi faceted in that delivery. Great Actors always want to achieve this and he does. The story line is intriguing. I loved the picture. Helen Mirren of course was superb as well as all the supporting actors. I will go and see it again,. The twist in the screenplay.If your not a Smith fan he will win you over with his performance. A little bit slow at times but worth seeing. Again Will gives a great performance. During this Christmas season, there are lots of fluffy jingle bells holiday films both on TV and the movies. This movie, besides having superior acting, had some depth; sorely craved at times. The holidays are not all marshmallow fluff and glitter. Glad to see such a beautifully done movie. Hats off to Will Smith for choosing something other than sci-fi space invaders and Armageddon-style this time! Well acted. Very touching. No car chases or lasers. This is for adults. anyone who has lost a child should see this movie. people don't understand what it's like. this movie told the true story & the pain that goes with it..
Beautiful, heart-warming and full of twists and surprises. Best film I've seen in a looooong time. This was the worst movie I have seen in a long while. The depressing story line dragged on & on. The only thing redeeming about it was the happy ending. Don't waste your money! I thought it was going to be an updated version of It's a Wonderful a Life but It wasn't even close. Best movie I've seen all year, I was amazed by the plot and loved the surprises throughout! Loved It. It had all the emotions a movie should. Plus a great cast with some awesome acting. Great movie and the acting was amazing.. star studded. Don't listen to the reviews, listen to your heart, just go see this film and enjoy. 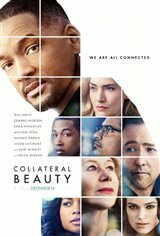 Will Smith is still good and who doesn't love Helen Mirren, Ed Norton and Kate Winslet! If you like Will Smith, you'll love this movie! This is a horrible movie. Rarely do you see false advertising for a movie to this degree. There was a good idea involved in this movie, but it got lost along the way. It tries to manipulate the audience with a very easy source of tragedy, but without any heart. It is difficult to get across how badly this movie fails since the trailers and summaries don't tell you enough facts. The summary is like the trailer. Parts are true, but leaving out the truth. Will Smith does a good job trying to bring Howard to life as a character, but the character is pretty poorly written. His friends? Are horrible people. Not just badly written characters, but actually terrible people that the movie wants you to sympathize with. Just don't go see this movie. It is really bad, dishonest, and manipulative in the worst way. You have to do more than have a tragic premise to make a good movie. I'm not sure how many great actors read this script and said "Yep, this will get me an Oscar." It is a movie that tries to force you to feel bad, instead of trying to get there in any ways that makes sense. Just save your money and watch a good film at home instead. I saw the movie and really enjoyed it, and the surprise ending. It brings up so many deep emotions within a person as it touches your heart in so many different ways. Everyone in the movie was excellent. I loved it. Nice to see a movie without violence for a change & one that doesn't insult our intelligence. Excellent movie. Great acting and a great story. Tragedy, grief, love, tears finding your way, stellar cast and acting, two twists that I did not see coming made for a great movie.